Overview… grizzled veteran player-coach of the Charlestown Chiefs. The Federal League hockey team is located somewhere in the heart of the Rust Belt, which is hit hard economic times in the mid-‘70s. 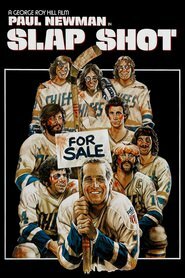 The Chiefs stink at hockey, no one goes to their games, and with the news that the town mill is about to close they are set to fold at the end of the season. At least that’s the situation until Reggie gets wind that they’re going to be disbanded, and goes on a one-man mission to save the team by any means necessary. Hockey is his lifeblood, and he’ll pull every backhanded string he can to keep the Chiefs alive. Where there’s a will, there’s a way. Personality… sly, manipulative, and charming when he wants to be. Reggie has a cynical sort of joie de vivre that buoys his determination to save the Chiefs. He also has a low tolerance for B.S., which is ironic because he is a master B.S.-er himself. He likes to think of himself as a “lover, not a fighter,” though his willingness to alter the course of his moral compass recalls the Groucho Marx quote, “Those are my principles, and if you don’t like them, well, I have others.” But while Reggie might be a rogue, his heart is usually in the right place. Reggie Dunlop's popularity ranking on CharacTour is #3860 out of 5,000+ characters. See our top-ranked characters and read their profiles.